Most patients who take anti-depressants give up their treatment in less than six months, the minimum period recommended for treating severe depression and other derived pathologies. This is the conclusion of a new study carried out by Catalan researchers, which reveals that only 25% continue their treatment for more than 11 months. "Only one in every five patients properly completes their treatment", Catalina Serna, co-author of the study, and an expert at the Jordi Gol Primary Care Research Institute (IDIAP) in Lleida, tells SINC. From 2003 to 2007, researchers from the Catalan Institute of Health (ICS) and the IDIAP Jordi Gol analysed 7,525 patients who were starting anti-depression treatment, looking at how long they continued with this treatment and the reasons why they gave it up. The results, published this year in the journal European Psychiatry, pointed out that, of the 3.2% of the population who started treatment for depression, 56% stopped taking their medication during the first four months, and less than 25% of the cohort continued their treatment for more than 11 months. 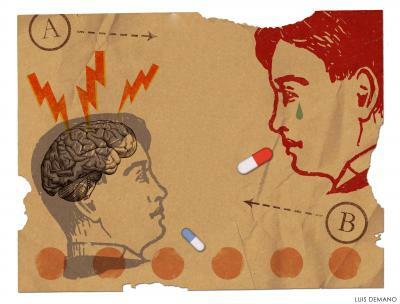 The researchers say patients are most likely to give up their medication during the acute stage of depression (the first months). "The levels to which they stick to their treatment also declines steeply between the first four and 12 months of the monitoring period", Serna points out. "In our study, only 22% of patients completed their treatment", the expert explains. "The higher completion rates seen in chronic cases are in multiply-medicated patients, who are twice as likely as other patients to continue with their treatment for depression (31% vs. 15.3%). Meanwhile, men are more at risk of giving up their treatment earlier than women (50% of men gave up their medication after two months, while 50% of women gave it up after three months). Depression is one of the commonest psychiatric diseases among adults, above all in industrialised countries. A European study carried out in 2004 found that almost 13% of individuals surveyed reported having a serious depressive illness at some point in their lives. This study revealed that in Spain, where anti-depressant use has risen in line with the availability of new drugs, 10.5% of the population suffers from depression.